The University of Miami Miller School of Medicine’s Department of Dermatology and Cutaneous Surgery will soon begin registering subjects for a clinical study investigating treatments for a rare but often fatal skin disease. From left, Paolo Romanelli, M.D., Febrizio Galimberti, M.D., Ph.D., and Yumeng Li, M.D. 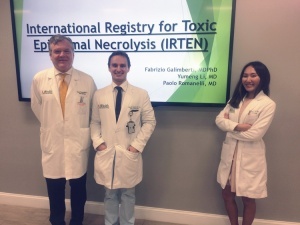 Romanelli is one of the founders of a global initiative called IRTEN — the International Registry for Toxic Epidermal Necrolysis — that opened in 2016 to oversee the collection of clinical data and biological specimens. The Miller School is one of four IRTEN founding centers in the world; the others are located at institutions in Zürich, Paris and Kyoto. TEN has a closely related disease: Steven Johnson Syndrome (SJS). Both are typically a dreaded side effect of medications. They are characterized by skin and mucous membrane tenderness and erythema, as well as extensive detachment of the skin. The term SJS is used for when the detachment affects 10 percent or less of the entire body surface, whereas TEN refers to a detachment of greater than 30 percent of the entire body surface skin. The mortality rate of TEN can be 35 percent or higher. Miami-Dade County is currently the national epicenter — the location with the greatest number — of new HIV infections. Broward County is number two. That, along with the fact that seminal studies in the treatment of the condition have been conducted at the Miller School, and that Dr. Romanelli has a very good academic relationship with Lars French, M.D., Ph.D., chairman of the Department of Dermatology at Zürich University Hospital and the ideator of IRTEN, are some of the reasons the Miller School is one of the four IRTEN research hubs. More information on IRTEN can be found on the organization’s website. Physicians wishing to refer patients for the clinical trial may contact Dr. Galimberti here.